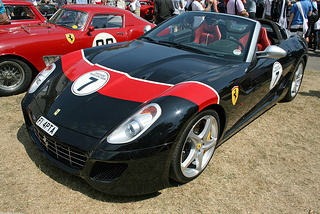 The 599 SA Aperta sports car was introduced by Ferrari at the Paris Motor Show of 2010, in the form of a limited edition of only 80 units to honour Pininfarina's 80th anniversary. It was, in fact, the convertible equivalent of the 599. Like the 550 Maranello, it was a pure open top car, and was fitted with a folding soft top that required to be operated by hand, and came with a safety recommendation that the car should not be driven above 70 mph with the top up. The interior was clad in leather, and there was a spacious boot. Designed by Pininfarina, there were two rollover bars discreetly positioned behind the seats, and the chassis had been redesigned to increase its stiffness without increasing the overall weight. With a combination of the ride height being reduced, coupled with a lowered windscreen, this produced a stylish and sporty profile. The front-engined, rear wheel drive two seater car was powered by the same high performance 6 litre, V12 engine as used in the 599 GTO, and developed 661 bhp, with a top speed of 202 mph, and a 0-62 mph time of 3.6 secs. 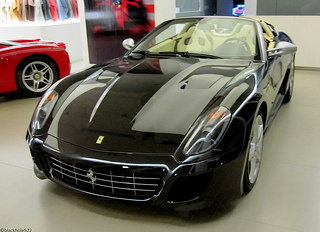 On the second market, a Ferrari 599 SA Aperta, in excellent condition, sold at auction for almost $925,000.